The following sections on fire performance and structural/seismic performance are excerpted from the paper “CLT Research: Available and Accessible to North American Building Designers”3 published in Wood Design Focus magazine. For a complete list of research references, download the paper at: www.woodworks.org/wp-content/uploads/CLT-Research_Podesto_Breneman.pdf. For current mass timber research in the United States and worldwide, including CLT and tall wood buildings, the Think Wood website includes a library of studies, categorized by topic area and updated regularly. Fire performance, and specifically exposed fire resistance, may be one of the most asked about areas in terms of additional research information—but, in reality, suffers more from misperception than lack of research data. The predictability of wood’s char rate has been well-established for decades and has also been recognized for years in U.S. building codes and standards. However, the use of existing code provisions has not been commonplace in modern commercial construction; therefore, jurisdictional comfortability with an expanded use of those provisions for the purpose of CLT design has presented a challenge. The 2015 NDS includes a char calculation procedure to provide calculated fire resistance of up to two hours. It expands on the design examples in the fire chapter of the U.S. CLT Handbook by allowing for laminations of varying thicknesses. Further study and additional full-scale panel tests continue to be done, not necessarily to prove legitimacy of the CLT char methodology, but to support expansion of its applicability. Areas of expansion include new assembly configurations (in pursuit at the Advanced Composite Lab and the University of Maine), exploring performance under nonstandard fires and developing performance prediction tools. It is commonly asked why there are not Underwriters Laboratories (UL) or equivalent tested assemblies available for CLT, and this area is often suggested for research. The truth is that the calculated method offers more flexibility to designers than a series of UL assemblies and provides more precision with regard to the panel thickness needed to accommodate fire-resistive requirements. When structural strength and fire resistance are so intertwined, a prescriptive method for determining fire resistance cannot offer material efficiency. A comparison of the ASTM E 119 fire-tested CLT performance and the predicted performance using the calculated method demonstrates the reliability of char calculations for CLT. Such a comparison can be done by independent designers but is also shown in graphical form with tests done prior to 2013 in the fire chapter of the U.S. CLT Handbook (Karacabeyli and Douglas 2013). The impressive ability of CLT to meet two and three hours of fire resistance with and without gypsum protection seems to be overshadowed by concerns about its combustibility. The increase of wood volume raises necessary questions about the additional potential for structural contribution to combustion and what it means for fire safety. Full-scale fire tests completed by FPInnovations and funded by Natural Resources Canada and others are intended to help address this issue. In association with a 13-story mass timber demonstration project (12 stories of CLT over one story of concrete) in Quebec, the provincial government there funded full-scale CLT fire tests to prove CLT’s equivalence to 2-hour-rated noncombustible construction. One series of full-scale compartment tests compared the performance of light-gauge steel, light-frame wood, and CLT. Tests included a three-story encapsulated CLT apartment simulation that ran for three hours. Results of the apartment simulation show the effectiveness of encapsulation in significantly delaying CLT’s potential contribution to fire growth and proved that the structure can withstand complete burnout. Another test focused on a 251/2-foot CLT stair/elevator shaft (exposed on the inside face with two layers of gypsum protection on the fire side) and studied the smoke propagation and leakage as well as its structural stability as a fire exit. The test ran for 2 hours and showed no sign of smoke or heat penetration into the shaft. Research recently completed by FPInnovations and funded by Natural Resources Canada/The Canadian Forest Service evaluated the ability of selected fire stops and sealing joints in CLT assemblies, both for panel joints and around through-penetrations to prevent the passage of hot gasses and limit heat transfer. Results showed that products commercially available for use in light-frame and concrete construction are also feasible for CLT applications (Dagenais 2014). There has been a proliferation of industry and academic research initiatives to build out the body of knowledge on CLT structural performance in U.S. applications. Some have pertained to standards and testing methods suitable to North America, such as the investigation of testing protocols for evaluation of in-plane shear strength of CLT panels (Gagnon et al. 2014). These and other efforts have led to the new “Acceptance Criteria For Cross-Laminated Timber Panels for Use as Components in Floor and Roof Decks” (AC455) from the ICC Evaluation Service. This product evaluation standard is generally compatible with the ANSI/APA PRG 320 qualification requirements with a notable addition of testing procedures for evaluating the in-plane strength of CLT panels. Having acceptance criteria for CLT panels allows manufacturers to pursue directed testing culminating in an ICC-ES evaluation report. Evaluation reports are helpful in gaining jurisdictional approval for new materials, further assisting designers. Current North American CLT manufacturers are promising evaluation reports in the near future. Research into connection technology for North American CLT has included static and cyclical testing of self-tapping screws for CLT-to-CLT and CLT-to-wood beams performed at the University of British Columbia in Vancouver, Canada (Hossain 2015 and Ashtari 2014). In addition to connection behavior, Ashtari et al. looked at the behavior of a horizontal CLT floor system as a diaphragm of a lateral force-resisting system. Using CLT components in lateral (wind or seismic) force-resisting systems is an area of considerable ongoing research. A much-anticipated project is the Development of Seismic Performance Factors for Cross Laminated Timber with principal investigator John van de Lindt of Colorado State University. This project will follow the Federal Emergency Management Agency (FEMA) P-695 process, which is currently underway, to rigorously quantify seismic performance factors (R, Ωo, and Cd) for a type of CLT shear wall system for use following seismic design procedures of ASCE 7. This comprehensive study was preceded by a site- and building-specific FEMA P-695-like study to estimate whether a seismic response modification factor of R = 4.5 met the performance objectives of the candidate design (Pei 2013). To date, CLT shear wall systems for seismic resistance have been designed using conservative seismic performance factors or using advanced performance-based seismic design procedures. The completion of this research will be a significant step toward easier design of CLT shear wall systems for seismic resistance and eventual inclusion of CLT in the seismic structural design standards used throughout the United States. Another research project evaluating CLT walls for seismic resistance is a Network for Earthquake Engineering Simulation (NEES)/National Science Foundation (NSF) project investigating seismic-resistant tall wood buildings for the Pacific Northwest (Pei 2014a). This multi-university project is executing an inclusive process to develop seismic performance goals, as well as a variety of potential high-performance/low-damage seismic force-resisting systems. Since the 2014 publication on this project, the research team has progressed to running a series of experimental tests of CLT rocking walls at Washington State University. Additional research is being performed on the design of CLT rocking walls at Clemson (Gu et al 2014) and the University of Alabama. The first full-scale application of CLT rocking walls is expected to be on the Framework building in Portland, Oregon, which will use the 12-story-high rocking walls as a self-centering seismic lateral force-resisting system. Full-scale testing is currently underway at Oregon State University and Portland State University. For more information on CLT research, another good source is the paper “An Overview of CLT Research and Implementation in North America”4 developed for the 2016 World Conference on Timber Engineering. 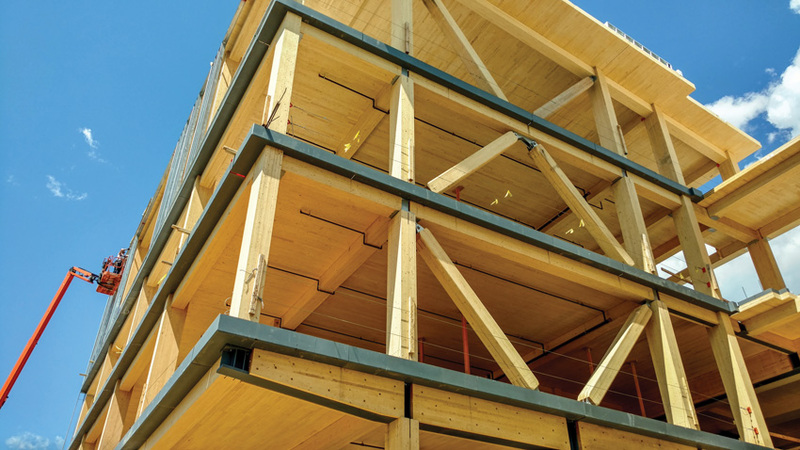 While some of the CLT research noted above has implications for tall wood buildings, numerous studies have also focused specifically on the feasibility of wood high-rises. One recent example, “Mass Timber High-Rise Design Research: Museum Tower in Los Angeles Reimagined in Mass Timber,”5 demonstrates the design of a code-compliant, high-rise mass timber apartment tower in Los Angeles. Using the existing reinforced concrete Museum Tower Apartment building as a basis, the study demonstrates architectural, structural, and fire performance improvements and trade-offs of the mass timber design compared to a reinforced concrete design. Another report, the “Survey of International Tall Wood Buildings,”6 offers a look at ten international tall wood buildings, and presents common lessons learned from the experiences of key stakeholders, including the developer/owner, design team, Authorities Having Jurisdiction, and construction team. To stay abreast of research related to mass timber, including CLT and tall wood buildings, the Think Wood website (www.thinkwood.com) includes a library of studies, categorized by topic area and updated regularly. Over the next decade, as researchers continue to provide information specific to North American products and building codes, many are predicting a dramatic increase in mass timber construction, similar to the increase seen in Europe over the past 10 years. There are many resources available to architects and engineers designing mass timber projects. For general information, the Think Wood website (www.thinkwood.com) offers an expanding library of materials on mass timber products, research, building examples, and developments related to tall wood buildings. The National Design Specification (NDS) for Wood Construction (www.awc.org) is the IBC-referenced design standard for lumber, glulam, SCL, and CLT, including fire design, fasteners and connections, etc. A mass timber building in the United States cannot be designed without the NDS. The U.S. CLT Handbook (www.thinkwood.com) includes detailed technical information on the use of CLT. It should be used in conjunction with information provided by manufacturers since most CLT currently available in North America is propriety (i.e., lay-ups aren’t standard across suppliers). APA Product Reports (www.apawood.org/product-reports) signify a product’s compliance with relevant provisions of the model building codes. The L-Series covers products manufactured from lumber, veneer, or other wood base, such as glulam and structural composite lumber (SCL). For one-on-one support (at no cost), technical experts at WoodWorks are available to provide free project assistance related to nonresidential and multifamily buildings in the United States, including those using mass timber. Designers have the option of contacting an expert in their region (www.woodworks.org/project-assistance) or emailing help@woodworks.org. 4Shilling, Pei and D. Rammer, M. Popovski, T. Williamson, P. Line, J. van de Lindt. “An Overview of CLT Research and Implementation in North America.” 2016 World Conference on Timber Engineering.